Custom Gable Brackets 36", 48", 60"
A great little gable bracket (36" wide) that just puts the right touch on your gables. Easy to handle and easy to install. Hit the more info for all the different options. This little gable bracket (36" wide) puts the right touch on your gables. We take it one step past the standard "Framer" by installing 2 cap boards making it a little different look. Easy to handle and easy to install. Hit the more info for all the different options. "Craftsman", probably our most popular line. Amazing what a custom curve can do for a gable bracket and your gables. Pick the right finish and your gable look will shout "Craftsmanship". Tap the picture for more info and all the details needed. Free shipping and ready to put together with all the fasteners or shipped fully assembled with all fasteners ready to install. A great little gable bracket (36" wide) with a "bow" just puts the right touch on your gables. Easy to handle and easy to install. Hit the more info for all the different options. A great little gable bracket (36" wide) with a "bow" just puts the right touch on your gables. Capped with 2x's makes it easy to handle and easy to install. Hit the more info for all the different options. A great little gable bracket (36" wide) with a "bow". Webs give this bracket the truss look. Easy to handle and easy to install. Hit the more info for all the different options. 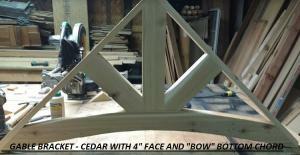 A great little gable bracket (36" wide) with a "bow". Webs give this bracket the truss look. Capped with 2x4's, easy to handle and easy to install. Hit the more info for all the different options. A great little gable bracket (36" wide) with a "bow". Curved webs give this bracket the fancy truss look. Capped with 2x4's, easy to handle and easy to install. Hit the more info for all the different options.